Howard set the tone for the Trojans, scoring a career-high 23 points against Villanova and 10 points against Wake Forest. He played aggressively, taking the ball to the basket and getting to the foul line. As well as Howard played offensively, he is still prone to making bad passes, recording three turnovers in each of the first two games in the Bahamas. 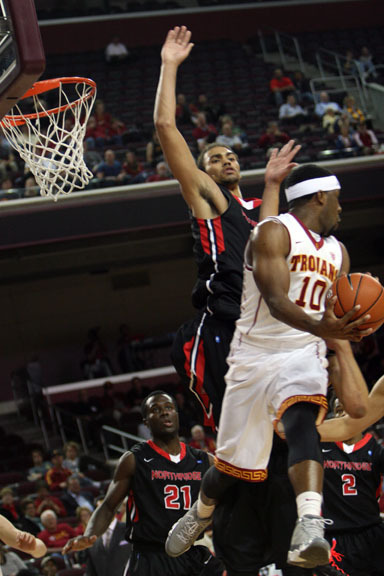 After averaging 13.6 points in USC’s first five games, Oraby scored 5 points against both Villanova and Wake Forest. He rarely demanded the ball in the paint, and when he was passed the ball, he repeatedly brought it down too low and turned the ball over. Fortunately for the Trojans, D.J. Haley stepped up and played hard against Villanova, scoring a season-high 10 points. Andy Enfield started Haley over Oraby in the second half against Wake Forest. The Trojans could not get anything going from beyond the arc against Wake Forest, making only 1-of-13 three-point attempts in the first half and 5-of-25 for the game. The Trojans will play Xavier on Saturday at 10 AM on AXS TV, allowing USC basketball fans to watch the game before departing for campus to watch the football team play UCLA at 5 PM.